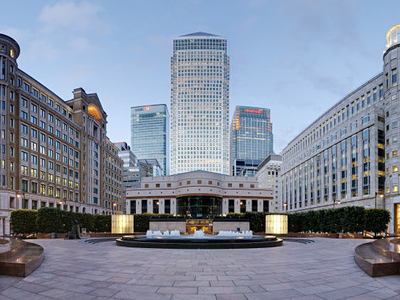 Cabot Square is one of the central squares of the Canary Wharf Development in London's Docklands. The square includes a fountain and several works of art, and is the address for the London Offices of Credit Suisse and Morgan Stanley. Cabot Place, on the east side of the square is a large shopping centre, and the square is also home to several restaurants including First Edition, Sri Nam and Corney and Barrow. Cabot Hall, on the east side of the square was a large banqueting and performance hall which opened in 1991 and is the venue for regular concerts and events. In 2006 Canary Wharf Group announced that Cabot Hall would close at the end of 2006 to be converted into additional retail and restaurants, and in 2011 the restaurant space was filled by Scottish restaurant Boisdale. Cabot Square and Cabot Hall are named after explorer John Cabot. Here's the our members favorite photos of "Plazas and Squares near London Borough of Tower Hamlets". Upload your photo of Cabot Square!